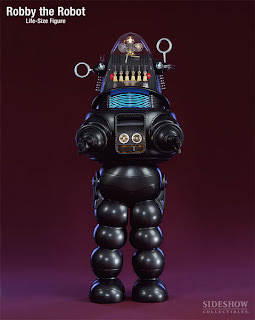 Probably the most iconic fictional character from the Sci-Fi movie genre is Robby the Robot. "Robby" is most remembered for his appearance in the '50's movie Forbidden Planet where he played protector and servant to Dr. Morbius [Walter Pidgeon] and Altaira [Anne Francis]. Fred Barton Productions, Inc. of Los Angeles, California will be recreating the life-size Robby for lucky collectors ... who have the disposable income. Each "Robby" will be hand-made using the finest materials available and arrive pre-programmed with a selection of lines that he will recite from the movie Forbidden Planet. Attention Serious Collectors! ... The Life-Size [7 foot tall] Robby the Robot is now available for pre-order from Sideshow Collectibles. Digital Audio: The robots audio section is digitally stored on an Apple iPod. When "Robby" talks, the mercury-vapor neon tubes in his mouth flash synchronously with his original voice as featured in Forbidden Planet. "Robby's" voice is driven by a two-way speaker-system mounted in the head. A high-power Alpine amplifier offers superior performance for crystal-clear speech and studio-quality sound. Mechanisms: The Special Edition was redesigned and engineered to offer the look and enjoyment of owning a Robby, without the added expense of intricate hand-made mechanisms as offered in the CE and DX editions. The SE does of course offer his motorized trademark vertical and horizontal scanners, which rotate as programmed. Head: 360° movement. You may turn Robby's head to face any direction. Gyro: Three engraved Lexan discs, interlaced with hand-painted, hardened steel hoops posed in a planetary orbit, mounted on a spun brass-bell housing. Above the gyros is a hand-turned aluminum heat-sink and Acrylic pilot light lamp housing. Scanners: Robby's trademark vertical and horizontal scanners are direct drive and rotate as programmed. Rocker Arm Assembly: Six posed and plated computer relays rest atop flashing actuator detail, which activate before and after Robby speaks for a fascinating effect. Reciprocating Arms: Two ivory colored arms accent the rocker-arm assembly and are posed just right for that definitive "Robby" look. Torso: Illuminated Heart Box: Aluminum-housed Acrylic Star and Indicator Light. Brass Quad Light. - Lights simulate movement. Fixed position Piano Keys. All lights in the head and body flash as seen in Forbidden Planet. Robot Body: In every way, the Special Edition of "Robby" is far superior in appearance over the original. In the retooling process, any flaws in the robot's body were removed, without compromising that special look the robot is famous for. "Robby" is now fabricated out of sturdy Fiberglas and weighs nearly 100 pounds. No thermoformed plastic (which will warp over time) was used in the making of the robot body. Robby was produced by an exclusive industrial fabricating house, whose Fiber-glassing standards and finish workmanship are substantially higher than those employed by the typical Hollywood Prop-shop.